Although spring may be a little late this year, Eclipse is ready to warm your hearts with singer-songwriter favorites such as Bridge Over Troubled Water, California Dreamin’, If You Could Read my Mind Love, Lovers in a Dangerous Time, Constant Craving, Teach Your Children Well, and others. 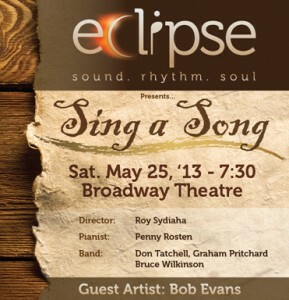 Eclipse, with its smokin’ band, will be heating up the Broadway Theatre on May 25, 2013, starting at 7:30 pm. So join us for a great evening of music on May 25th, at 7:30 pm. Tickets are available at the Broadway Theatre, and from group members. Call (306) 384-3456 for more information.